What is stressing today's college kids? A recent study showed young people today are as much as eight times more stressed than kids who lived during the Great Depression. NORFOLK, Va. (WVEC) — Looking back, some of us might say that our college years were the best years of our lives. But how many kids in college today truly feel that way? A recent study showed young people today are as much as eight times more stressed than kids who lived during the Great Depression. So what's stressing out kids out today? That's what we wanted to know. Some students wrote that it was the usual things... boys or girls, even roommates. "What does the future hold?" one student asked. We noticed that some common themes began to emerge as we surveyed more students. "It's hard to tell family 'no,'" another student said. A number of students wrote that grades were a big source of stress because "it kind of determines where I'm going to fall in the future." What about paying for college? "Tuition stresses me out because I don't want to be in debt for the next four years and after," we heard time and again. We took our whiteboard filled with answers to Dr. Narketta Sparkman-Key, who speaks with students on campus about stress. Dr. Sparkman-Key told us that students not only feel the pressure of school, work, and grades, but also struggle to figure out who they really are as young people. "So they are navigating all of these things right now and they haven't been here before," she explained, adding that if students want to lower their stress, they need to learn how to navigate the pressure. When it comes to money, Dr. Sparkman-Key says students need to make a budget and follow it. She also points out most kids have college debt, and they should accept it. That might lower the stress. As for stress over grades, just focus on this semester, and what it is you can control. As for social media, Dr. Sparkman-Key says to give it a break. Who needs to deal with other people's drama? And in our angry and uncivil times, manage your exposure as well. 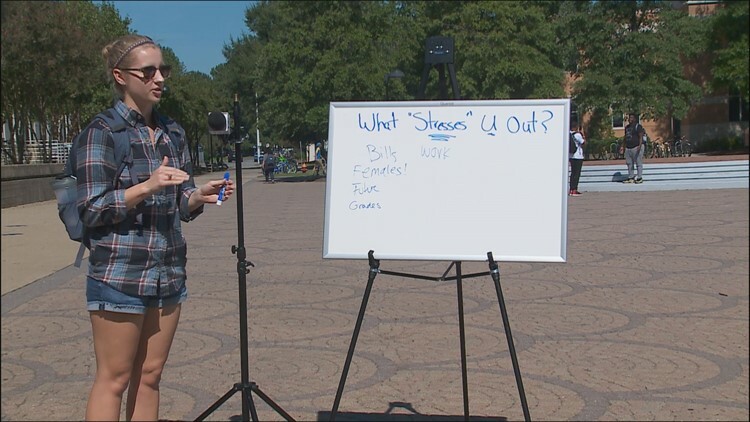 "I also think with the political climate we're in, students are feeling they have to take a side or a position on an issue. It can cause stress," Dr. Sparkman-Key says. Parents need to know that a lot of kids want them in their lives. "You want to make time for your friends and family. Say you miss them. Say you love them when you can," one student told us. Dr. Sparkman-Key says parents sometimes are to blame for the stress their kids have. They sometimes make life look too easy, adding "I think there's an expectation that you should be a certain way, that you should be perfect. You should be able to do all of this and do it well." And when parents deal with their kids, listen to them! "They need us to listen authentically and listen without being judgmental. 'I know how you are feeling. I know this may be stressful and you're trying to navigate that. Let's talk about how we can support you as you navigate that,'" she added.